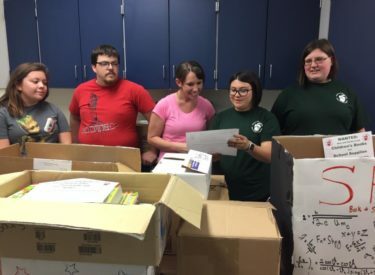 Saints Promoting Education Careers (SPEC), the club for education majors at Seward County Community College, conducted a school supply and book drive in April for students at Sunflower Elementary School. Club members presented the items on May 9 to Jeana Winchester, instructional coach at Sunflower, who accepted the donation on behalf of the school. The students collected several boxes of used books and two boxes of school supplies and new books. In addition, club members purchased 50 new books with club funds and presented these as a gift to Sunflower students. The book drive is one of several community service projects done by the club during the school year. Club members include Cassidy Velasquez, president; Amy Fox, vice president; Kem Zamora, Lucero Loredo, Sheney Redmond, Carlos Hernandez, Abby Lovato, and Kolton Hodges. Club sponsor is Janice Northerns.